Pobeda Gallery is proud to present its new project Natura Morta, which unites the works of seven Russian and American photographers on the basis of still life genre. The authors are Jefferson Hayman, Paulette Tavormina, Charles Grogg, Michael Huey, Irina Polin, Vadim Gushchin, Aleksei Kiselev. 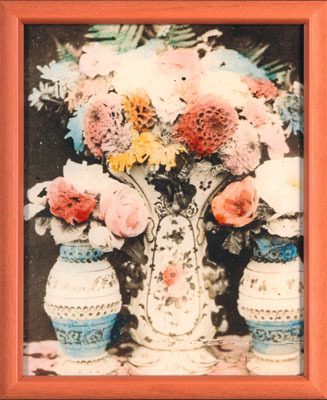 According to Charles Grogg, commenting on his early still life pictures of flowers, inanimate objects give a rare opportunity to run prolonged technical experiments that are usually related to lighting, nuances of light and shadow etc. At the same time, photographers instinctively try to overcome the static and “statuary” nature of such objects, not contenting themselves with the fixation of reality, but divining the vibrations of secret and invisible life. The artists rehabilitate the most common things (like tableware in Irina Polin and Michael Huey’s works or bread in Vadim Gushchin’s series), setting them out of the context of “overviewing” and “overusage”. 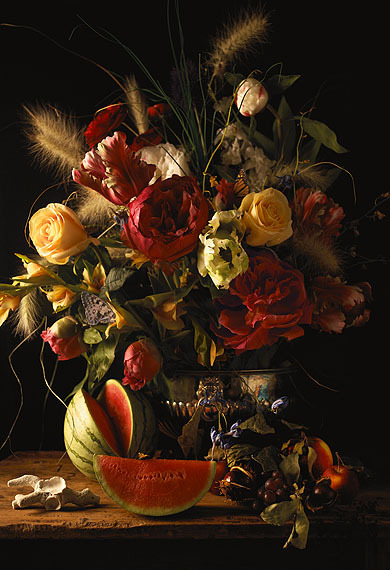 For instance, still life photographs by Paulette Tavormina, inspired by Dutch painting of the XVIIth century, are carefully composed, have every element rigorously put into its place. On the other hand, these works ironically use baroque fancy for allegory, referring not to universal categories, but to images from the personal experience of the artist (like fig, which grew in her family garden). Another baroque technique used is trompe-l'œil. Fruits and vegetables, looking like some decorations of an invisible counter, seem to fall out of the frame, making the compositions even more unstable. Jefferson Hayman’s infatuation with past turns into aesthetic nostalgia. A pair of shoes, a glass, a roll of recording tape and other ordinary objects transform into artifacts of a fading reality, arousing a strange feeling of time going by; we try to recall some image or impression, but the cups and vases we remember have nothing to do with Hayman’s objects that are more like Giorgio Morandi’s painting than your average supermarket goods. Charles Grogg in his Reconstruction series does nearly the same, renewing our perception of an object, using a very unique printing process and composing his works of several separate fragments. Grogg slows down and complicates the process of watching, playing with viewer’s expectations; he interferes in the very nature of two-dimensional image, adding traces of some fantastic vegetation’s existence in the form of threads and sutures. The artist turns ordinary into unique, making us look for new approaches. 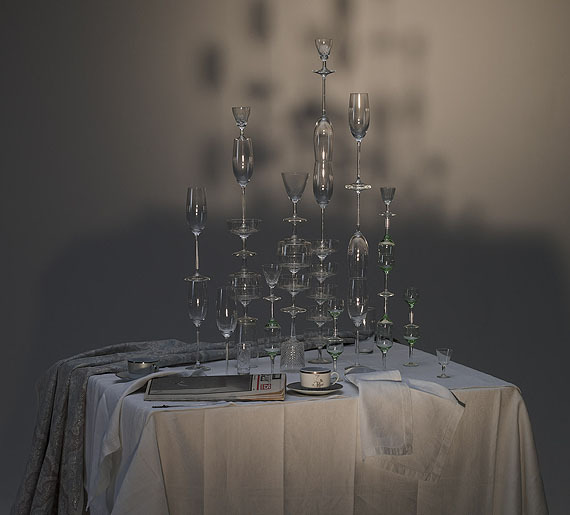 Irina Polin builds fragile towers out of glass and crystal tableware; wineglasses, cups and goblets, united in decorative constructions in a sterile and empty space, get purged of their utility. Stacks of china on Michael Huey’s pictures also lose their materiality when presented as negatives, knocking us out of habitual visual balance. 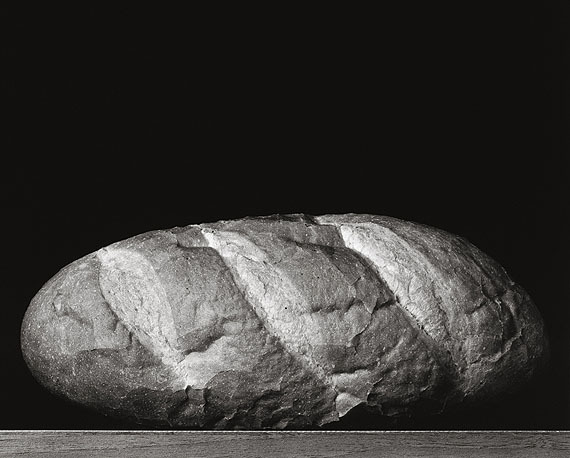 Vadim Gushchin’s black-and-white series Hleba (Loafs) attain the same result by using close shot, leaving only emasculated outlines and pores of the bread loafs that become merely signs of themselves. Aleksei Kiselev’s stand-up meal reportages are absolutely different; food and dishes don’t pretend to be anything but what they are. Photographer’s greedy glance captures weird compositions, sometimes perfectly symmetrical, sometimes absurd, like the combination of M&M’s candies, incense burners, figs and a bestiary tapestry as a background. Such pictures provoke and stimulate a viewer’s interest, changing his modus of perception.